Farnsworth Canyon is located in the San Rafael Swell between Green River and Hanksville, Utah. The lower end of the canyon begins with a fun slot to hike through that opens up into a deep canyon. The easy to hike wash can be followed all the way through the reef where there is another trailhead that can be approached from the west. Enroute there are a couple of minor arches to investigate as well as some interesting pictographs. On this trip we were also able to see some bighorn sheep near the mouth of the canyon. 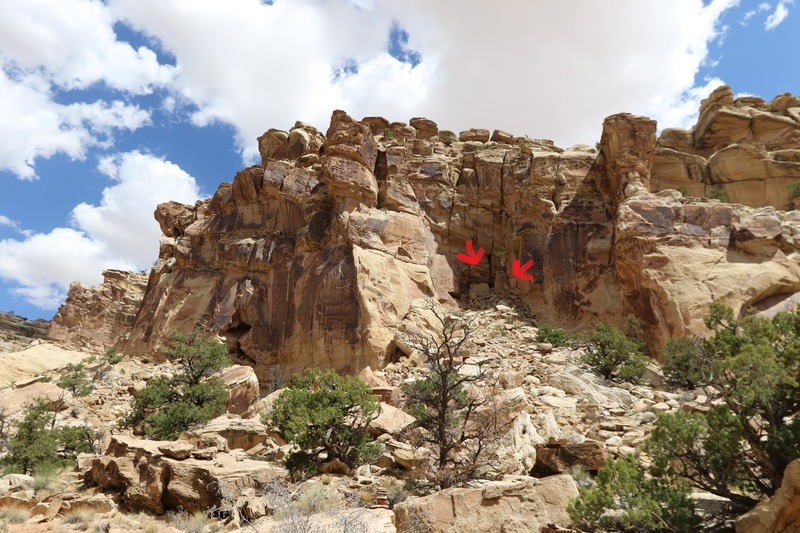 To get started find your way to the Temple Mountain Road by heading south on Highway 24 from Interstate 70 for 24 miles or north from Hanksville for 20 miles. Head west on the Temple Mountain Road by following the signs for Goblin Park for 5 miles where there is a pullout and kiosk on the right hand side of the road. Just past the pullout on the left is the turnoff to Goblin Valley. Follow the dirt road behind the kiosk going north which is Emery County #1015. Stay to the right around the half mile point and again at the 1 mile point where the dirt road turns up North Temple Wash. As the route continues along the front of the reef it crosses a very rough shallow wash where vehicles will need at least a moderate amount of clearance. The Farnsworth Canyon trailhead comes up about 1.5 miles past the mouth of North Temple Wash making it 2.5 miles from the pavement. 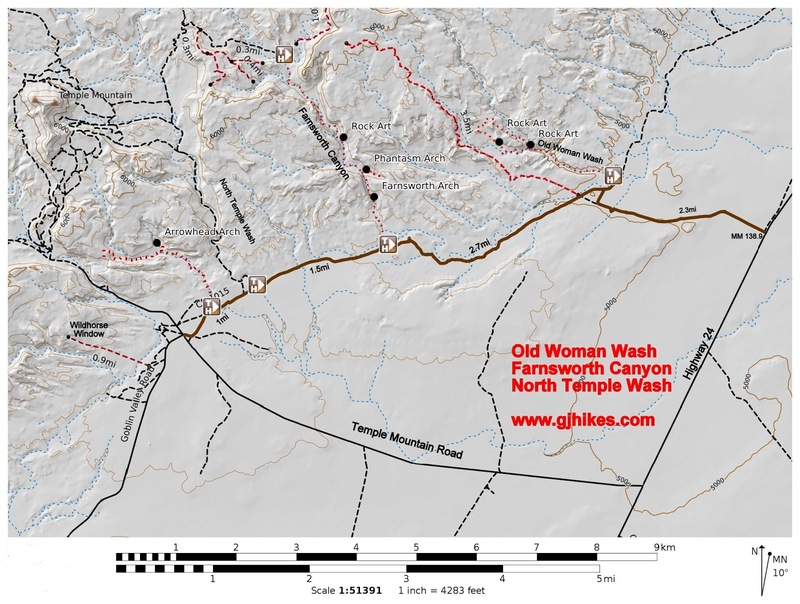 It is also possible to get to the trail from the north but the road between Old Woman Wash and Farnsworth Canyon crosses a lot of little washes with sharp dips that are full of loosely packed dirt. Other than that it isn't too bad. From the trailhead there is a well worn path that heads straight to the wash.
On the day that we took the photos for this post there were some bighorn sheep on the sandstone domes on the other side of the wash. They were far enough away that they might have gone unnoticed if we hadn't been looking for them. We also saw a couple of antelope near the road before entering the wash but they weren't interested in sticking around for a picture. As the wash begins entering the reef it transitions into a nice stretch of narrows. There is a side slot on the right just before the narrows where the Farnsworth Canyon Arch clings to the side of the cliff. It is a pretty tough scramble to climb close enough to see any blue sky through its little opening. At its narrowest point the wash is probably still wide enough for a horse. As the narrows come to an end and the wash begins widening there are a few large boulders to navigate around before the canyon really opens up. There are several short side canyons that connect with the main wash. Some lead to arches or bridges and maybe even some rock art. The first side canyon on the right after passing through the narrows is where Phantasm Arch can be found. It is almost impossible to see the arches opening from below but we were able to get a picture that shows a patch of sunlight shining through it. The arch is just inside the side canyon near the north rim. Continuing up the main wash the hiking is pretty easy. The ground is mostly gravely sand and rocks making it firm enough not to be unpleasant. To see the popular Sunlight & Shadow pictograph panels keep your eye out for a large boulder with a cairn on top of it. If you hiked straight up the canyon the cairn is around the 1.5 mile point from the trailhead. The panels are in a notch at the top of a rock slide about 80 feet above the wash. The paint of the Shadow Panel is so well preserved that it is easily visible from below. There is a well worn path leading up to the panels but the rock is loose and it gets steeper near the end. The panels are a perfect classroom for showing the effects that sunlight has on pictographs over hundreds of years. The Shadow Panel looks like it was just painted while the Sunlight Panel is fading away and gradually loosing its detail. The wash continues to be fun to hike on past the pictographs and is well worth further exploration. 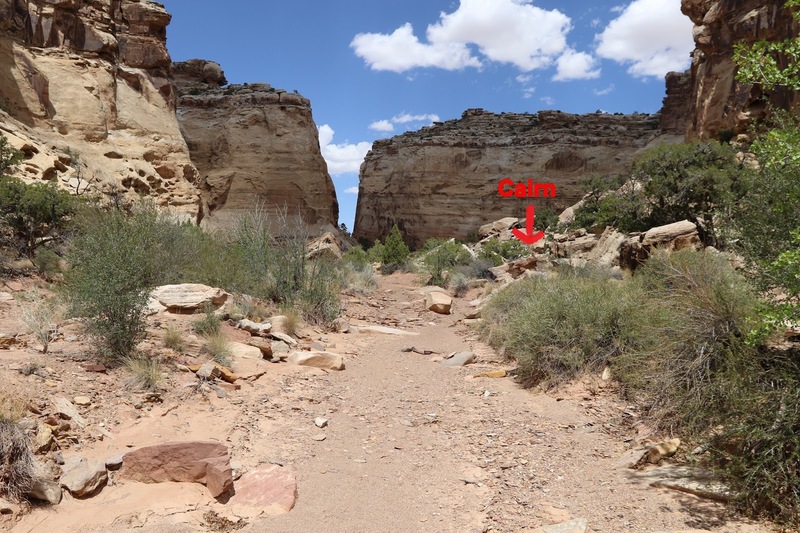 If you keep going and follow it on through the reef you will reach the upper trailhead around the 3 mile point depending upon whether you explored any side canyons. This is where we turned around at for this post. Farnsworth Canyon is a fun hike with its narrows, pictographs and scenic geology. Other than climbing up to get a closer look at the Sunlight & Shadow Panels the whole thing is suitable for families with small children. If all you do are the narrows then you are looking at no more than 2 miles round trip. The pictographs would be about 3 miles round trip if you don't climb up to them. The fact that passenger cars can't make it to either trailhead probably keeps a lot of people away. For those that can get there they should find it well worth their time. If you would like to see it for yourself then all you have to do is 'Take a hike'.